Thats easy peasy ! : SMOOTHIES! It proves tough to get the daily recommended portions of fruit into children, especially in the winter months. Smoothies are not only great for this but are so refreshing in the summer months and so versatile. 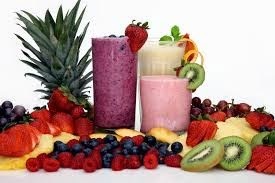 I tend to fill up the smoothie maker or a blender and make some delicious smoothies as a day time snack. The best thing about them is you can add virtually any fruit to a blender (bar the likes of kiwis or apples as they need to be juiced) along with any other ingredients you like. Trying to encourage them to eat fruit can be tricky but these smoothies will be the answer to your problems! They are great for a cool refreshing snack drink during the warm summer days too. Served to 2 eager boys and one busy big boy too! You can add ice cream to this if you like but leave it out for a healthier option. This can be set as a refreshing sorbet too by placing it in individual bowls and placing in the freezer for about an hour to semi set. Serve straight from the freezer. Just have a play around and see what delicious drinks you can come up with. TIP: By freezing your fruit and adding them directly from the freezer into the blender when making your smoothie, will give your drink a deliciously refreshing touch!